The Waddell Mariculture Center has been protecting our waters since it took its first water and soil samples in 1979. Located on the Colleton River, off Sawmill Creek Road, the site is part of the Victoria Bluff tract, now in the Victoria Bluff Heritage Preserve. These 150 acres have public access trails and a boat landing, plus a unique maritime center that includes research buildings, ponds, and a hatchery. The Packet wanted to let us know that Al Stokes, the “Fish Whisperer” as he is known, was retiring and sure to be missed. He was there from the beginning and was part of the center’s cutting-edge techniques in assisting nature in propagating shrimp, striped bass and cobia. They release 2,000,000 fish a year to the delight of local and visiting fisherman alike, and for the overall success of the sport fishing industry. Stokes reports that this is a billion-dollar industry for South Carolina. During his tenure, he was there to fight off several threats to our pristine waters. A petrochemical plant in the 70s, a production site for oil rig products, and most recently a boat building site were all proposed for this location with deep-water access. Fortunately, none of these were successful as they would have had significant negative consequences for local waters. Al Stokes has the Lowcountry in his blood. He grew up on the river and at his retirement he asked that we all continue to protect this fantastic asset. The recent ban on plastic bags and straws, he noted, was good because everything adds up. 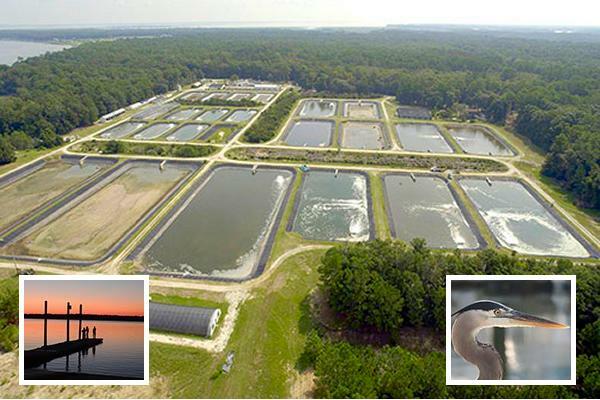 He has been on the cutting edge and helped build the reputation of the Waddell Center as one of the largest and “most sophisticated aquaculture research and development centers in the world”. I enjoy my life in the Lowcountry, in some ways more with each passing year. I benefit from people before me who cared and dedicated their working careers and volunteer time to protecting our waters and ecosystem. To Al, job well done! May your research and your hard work protecting our environment continue for many generations!